Last January 2019, we published an exclusive Special Report from our partner broker Unicapital Securities about their Top Stock Picks by Sector for 2019. Click the link to view the full report. 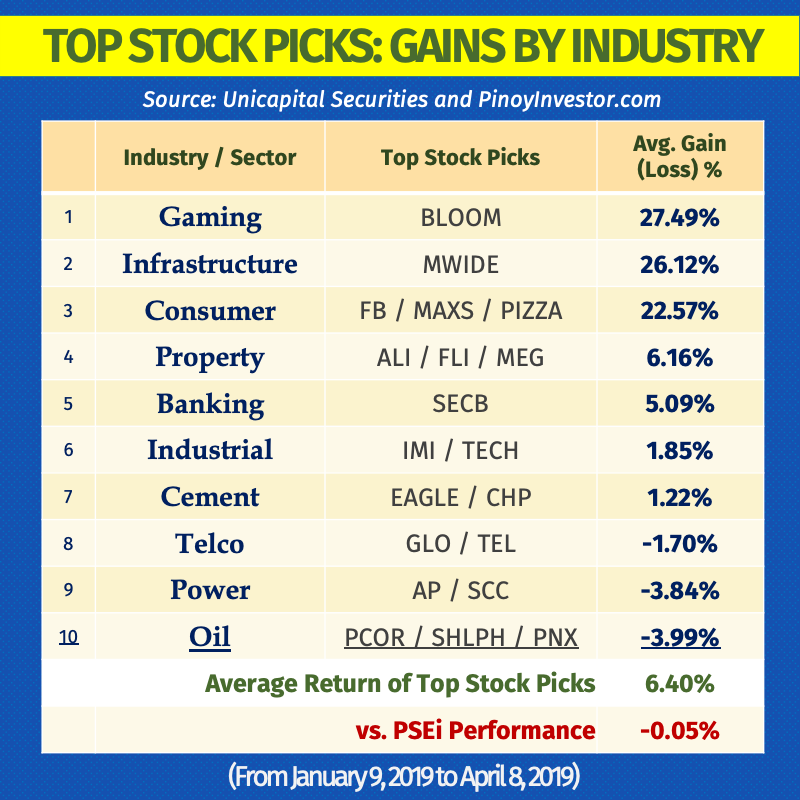 Did you know that while the PSEi lost -0.05% in the last 3 months, our partner broker’s 20 Stock Picks with a Buy recommendation outperformed the index and managed to book positive gains of +6.40%! Take a look below. BLOOM is gaming top stock pick. Entertainment City gross gaming revenues grew by 27.2% to PHP 103.1 Billion during 9-months 2018. In our estimates, Entertainment City GGR will hit PHP 141.1 Billion by year-end on the back of strong tourist arrivals in the country, which posted an average 8.1% annual growth over the last 10 years and 8.3% in 9M18. Korea and China, which are the main foreign players in PH casinos, remained as the top two markets by country, with China posting the highest growth of 34.9% during 9M18. We are positive the industry growth will be sustainable for the next five years. BLOOM is our gaming stock pick due to its sustained market leadership, better fundamentals relative to its peers, and aggressive expansion plans. Bullish on MWIDE. Public and private construction spending grew by 29.0% and 14.4%, respectively during 9-months 2018, higher than 9-months 2017’s 13.0% and 7.3%, driven by the government’s thrust to develop infrastructure. As a construction company and operator of the Mactan-Cebu International Airport (MCIA), MWIDE will benefit from the government’s infrastructure development program. However, the budget reenactment may reduce government spending in 2019 by around PHP 220 Billion, as estimated by the Department of Budget and Management. 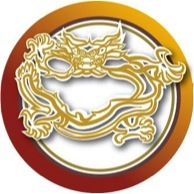 We are bullish on MWIDE amid positive business and industry outlooks. 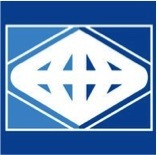 In addition, MWIDE’s increased capacity from the commercial operations of MCIA Terminal 2 and newly added business segment (leasing from the Paranaque Integrated Terminal Exchange) would temper the cyclicality of construction and boost the stock’s value. FB and JFC to outperform. We saw a 7.6% decline in overall stock prices of the consumer sector in 2018 due to gloomy investor confidence amid rising inflation rates. However, we expect FB and JFC to continue outperforming the sector, given FB’s diversified business portfolio and JFC’s ability to offset domestic pressures through its broad geographical footprint. Overall, we forecast consumer companies under our coverage to benefit from the upcoming mid-term elections in May 2019. We project average revenue and net income growth rates of 11.4% and 8.8% in 2019, respectively. The sector will also be supported by declining global oil prices and tamed inflation rate. ALI as top Buy in sector. The residential segment of property companies will be challenged in the long term if interest rates continue to go up and inflation continues to exceed the BSP’s 2%-4% range. Homeowners will be put off by the rising rates and careful with spending, given inflated prices. In our view, those with a solid recurring income base, such as ALI, MEG and RLC, can weather the challenges. MBT takes the lead. Metrobank (MBT) maintains the lead among the big banks in the net interest margin (NIM) arena, amidst rising rates. With domestic rates still subject to the course set by the US Fed, MBT has enough room to absorb rate hikes. If hikes are passed on to the higher-yielding consumer loans, this deters further borrowing, limiting interest income growth. EW, BDO and MBT will be affected by this slowdown in retail loan growth. SECB’s focus on growing its consumer loan segment will also be strained. We are reviewing our Target Price and ratings since both EW and MBT have reached our target prices while potential upside for the rest in the coverage are now below 10.0%. IMI and TECH insulated from trade war. Stocks in the electronics and semiconductor industry plunged by an average of 34.6% in 2018 as the market was overly bearish due to the trade war uncertainties. Based on our estimates, the potential tariff imposition resulting from the trade war would only have a minimal effect of about 5% of the total revenues of IMI’s China operations because majority of the raw materials are sourced internally. TECH’s major operations are situated in the Philippines, thus it is more insulated from geopolitical tensions. EAGLE most attractive. Stocks in the cement industry fell by an average of 40.7% in 2018 and are expected to continue weakening due to sluggish average earnings growth amid slower improvement in cement prices and production capacity. Higher average coal price, which is a key operating expense, contributed to lower margins. Among the three companies in our coverage, EAGLE is the most attractive due to its strategic location and healthy cash level that insulates the company from elevated interest rates. Our valuation for EAGLE could possibly be lifted by higher demand from the proposed Bulacan airport. We expect production capacity to be steady in 2019 and gradually pick up by 2020, which supports our projected average revenue and net income growth rates of 7.2% and 3.2%, respectively. GLO has better cashflows. We note that both GLO and TEL have been paying out about 60%-75% of prior year’s bottom line and assessed both companies’ ability to sustain dividend payments. We project GLO to have better cash flows due to the divestment of its tower assets. This would reduce its debt level as a result of lower maintenance CAPEX. The reduction in interest expenses would also lead to better earnings, which would be enough to support future dividend payments. GLO’s current price level still provides decent dividend yields. FGEN to benefit from growing demand. Peak demand is expected to grow 5.7% annually from 2017 to 2040. This growth will be mainly driven by demand from the commercial segment (communications, BPOs, and real estate such as condos, malls, casinos, hotel and restaurants), which historically has a 10-year CAGR of 5.4% (vs. 5.0% from residential and 4.5% from industrial). We believe that the need for continuous capacity addition to meet future electricity demand presents lucrative prospects for power companies. Decisions regarding the approval of project applications should pick up as the Energy Regulatory Commission (ERC) now has a quorum after its four commissioners were suspended last year for neglect of duty. The approval of MER’s pending power supply agreements and FGEN’s LNG proposal are among the projects we are monitoring. FGEN has reached our Target Price of PHP 20.50/share, closing at PHP 21.35/share last Jan 4. Thus, we are currently reviewing our Target Price and rating for FGEN. PCOR less susceptible to oil price volatility. In mid-2018, crude oil prices were almost at four-year highs (Brent $81/bbl in September), which increased pump prices, tempered sales volumes, and lowered gross margins. We believe the oil price volatility will persist given the concerns over global oil demand and economic growth. Oil prices have been falling since the last quarter of 2018 (Brent at $54/bbl in end-2018), which would boost sales volumes and eventually improve margins. In early December, OPEC and non-OPEC countries agreed to cut oil supply by 1.2 million barrels per day. This could gradually increase oil prices, with forecasts between $60-$72.6/bbl for Brent in 2019. We note that the volatility in oil prices may persist amid geopolitical risks, including the U.S.-China trade war. We believe PCOR is less susceptible to crude oil price volatility since it utilizes hedging strategies.